This year, we didn’t celebrate Easter at home like most Romanians do, but instead we went to Bucharest where my mother in law lives. It wasn’t planned, but I received a (very minor) blogging award here in Bucharest, the festivities were one week before Easter… so we decided to stay a bit more and enjoy my mother in law’s traditional Romanian Easter goodies, while Baby Romanian enjoys the change of scenery. What did we, the adults, enjoy the most? The food, of course! 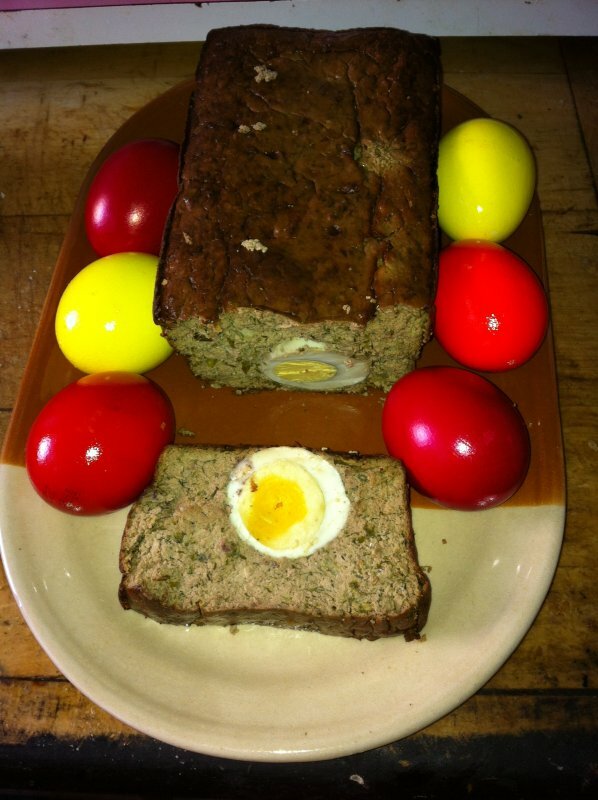 And this is exactly what we’re talking about in today’s article: traditional Easter foods in Romania. In case you didn’t know, the Romanians love their food and even though more and more are starting to look into healthier options, traditional holiday foods are greasy, full of calories and… delicious. 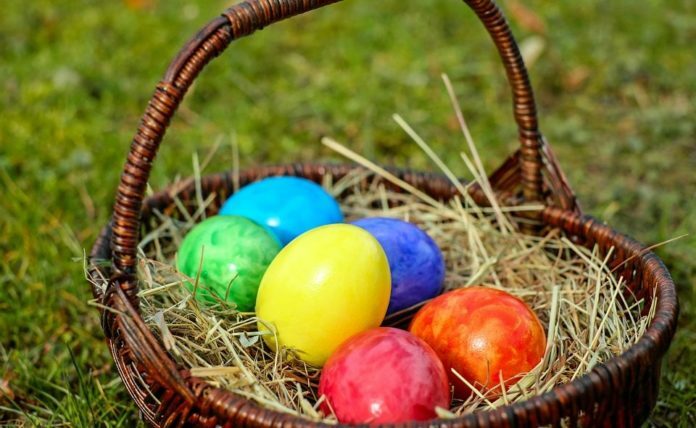 And since I certainly put on a few extra pounds since I have arrived here in Bucharest, I have decided to share with you why: some traditional Romanian Easter dishes you can normally enjoy during this time of the year! An absolutely delicious dish that is made from the most horrible sounding stuff: the lamb’s organs (heart, liver, lungs and kidneys), mixed up with fresh and boiled eggs, green onions, garlic, parsley and dill. It’s very easy to make and it’s absolutely delicious. The one you see in the image above was made by my wife from chicken liver, which I prefer. Since people in Romania rarely consume lamb during the year, now it’s the time to eat everything made of lamb. Including a thick, delicious lamb stew filled with delicious spring veggies, rice or homemade pasta and, of course, a lot of home made tomato juice. Because, yes, in Romania, most of the things that you can buy in stores are still made at home by our parents and grandparents. 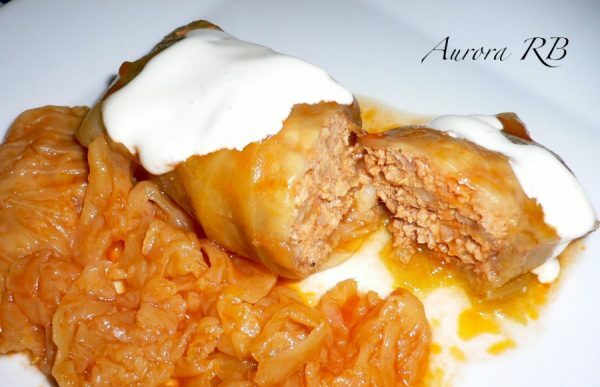 Translated as “cabbage rolls,” these are traditional eats for Christmas and the New Year celebrations, but many prepare them for Easter too. 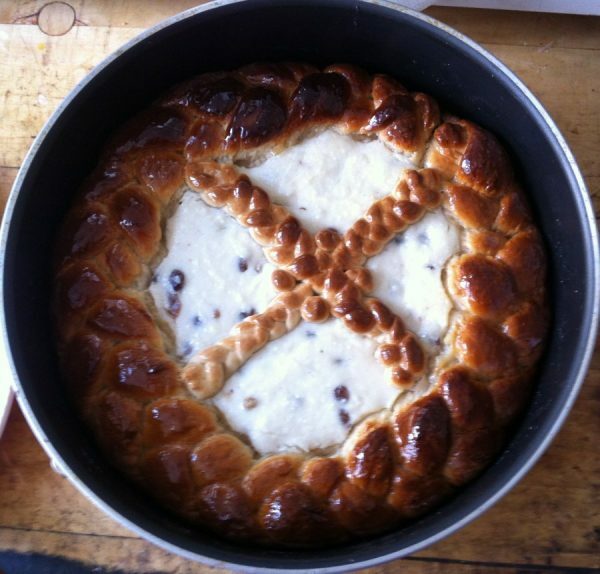 Basically, whenever you have a special occasion in Romania or any sort of celebration, it’s time for sarmale! 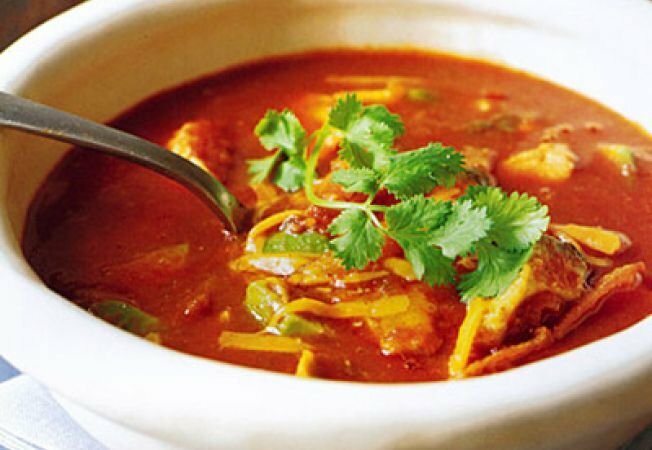 There are various ways to prepare them, but usually you have minced pork meat, mixed with onions and rice, rolled in sauerkraut and boiled in a mixture of the sauerkraut’s juice, water and tomato juice. The result? Something absolutely delicious – even though it might not sound like it from reading the list of ingredients! A lot more delicious than it looks in the photo above (and we forgot to take some better pictures, too), this is a kind of a pie made with cheese, sugar, raisins and various other flavors like vanilla or rum. I would compare its taste with that of cheesecake, but Pasca is of course more delicious. Ha! Again, something that’s traditionally baked for any special occasion, while the sarmale are boiling. It was my wife’s first try and they were delicious, even though she used too much filling, so they cracked open during the baking. 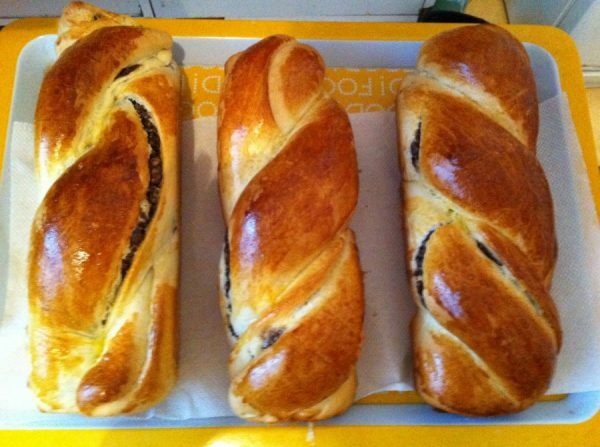 They’re pretty easy to prepare: sweet dough rolled with a sweet mixture of walnuts, cocoa, raisins and Turkish delight (the last two can be omitted) and baked until ready. So… there you have it! These are the traditional dishes that Romanians eat during the Easter holidays and the reasons why I gained so much weight. They might not look like it, but they’re delicious! Happy Easter! PS: If this article tickled your appetite and made you hungry, then you should definitely NOT look at my article of 20 traditional Romanian dishes you must try at least once in your life. That lamb stew looks flipping awesome. Thanks for sharing these dishes, C. Romania isn’t currently on the list of countries we’ll visit next year, but we’re going to be fairly close…maybe we can make it happen. Well, you’ll be a stone’s throw away so yeah, maybe you can make it. The food is really worth trying! I would love to cook traditional dishes for foreigners! I will be curious to give everyone a taste, or a full meal, of Romania. Hi C: You are kidding about Baby Romanian enjoying Bucharest’s air, I think;-) Did you drive or take a bus or train from your home in the SW? Maybe you decided to tough it out with Bucharest’s traffic? 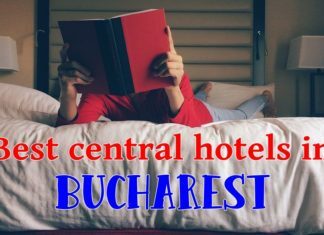 Does Mother-in-Law Romanian live right in downtown Bucharest, or is she in a quieter part of town? I guess the weather is pleasant at this time, though. Has Wife Romanian, with her obvious culinary skills, considered vegetarian substitutes? Thanks for a real “Romanian Experience”! All of the above can be made without meat/eggs/milk, but they won’t taste the same. I made the Pasca dish egg free because we think baby Romanian has an egg intolerance, so that was the only dish I could eat, which is a shame cuz they smelled delicious. He forgot to mention the pork steak he did on Sunday, it usually is with lamb but we don’t like it very much. Plus you have to buy it very fast or else they run out. I did consider a vegetarian lifestyle, at least one with dairy, but I think is harder here to find your veggies in winter, and Baby Romanian needs the meat at the moment. I really admire those who can go vegetarian, I think it needs a strong will and determination. Hello Teal, yes, I was joking about the Bucharest air 🙂 My Mother in Law doesn’t live in a central location, but Bucharest is busy everywhere – even the suburbs are starting to get crowded, although there’s a different life out there. There are quite a few vegetarians here and one would have no trouble living well as one. We have reduced meat consumption – at least processed meat consumption. I am in total awe of this banquet you have laid before us readers. I can say that I would enjoy all but the Drob. I’m not a fan of Offal, (except for liver) being that of any animal. But hey, that’s not to diminish the dish. That is a home grown Romanian celebratory dish, and I respect that. I would eat it, if it was put in front of me. It would not be nice manners not to eat it. I could only imagine the wrath of the cook if I didn’t eat it. PS. Compliments to Wife Romanian for the dishes cooked and baked. The photos of the dishes are great, and I could only imagine the aroma of them. I wish there was “smell-a-vision”, so we could all get a sample of the aromas. Thanks, Shawn! They were indeed delicious! And I would personally accept if you wouldn’t want to try something you don’t like. I like liver, but not the other organs either, and that’s why we tuned down the drob to only use that. We also have a dish – a stew/soup thingie – made of cow’s stomach and for years I couldn’t get myself to taste it especially because it smells quite bad. But recently I decided to give it a try and it was actually really good. So some things that sound creepy might be tasty – but it’s not a problem if you don’t consider them like that! I can say I am the kind of cook that asks before serving. I know I had trouble eating drob, but that was before I made it myself. So nothing is served unless you really like it, no point in spoil a dish on someone who doesn’t like it. More for us!!! :))) No, in fact the custom is to put everything on the table and everyone help themselfs with what they want. It usually is so much food that aren’t too many that can eat out of everything, so it is best to choose wisely, or leave some for later. Gonna take a while, but I will translate them as soon as possible! Oh, I would so eat every last thing! They look delicious, especially the cozonac and stew. Anything with lamb just has to be good..:0) . Wife Romanian is a great cook from the pictures!!! Well, I remember that you really enjoyed the Hungarian foods and ours are not very different, so I am sure you would totally enjoy them! I’m a vegetarian, but the pie looks great! I’ve never had anything like that. Congrats on your blogging award C! That’s pretty awesome. I haven’t had Romanian food before but it looks great. There are some Romanian restaurants here in NYC…I should try it out one day.